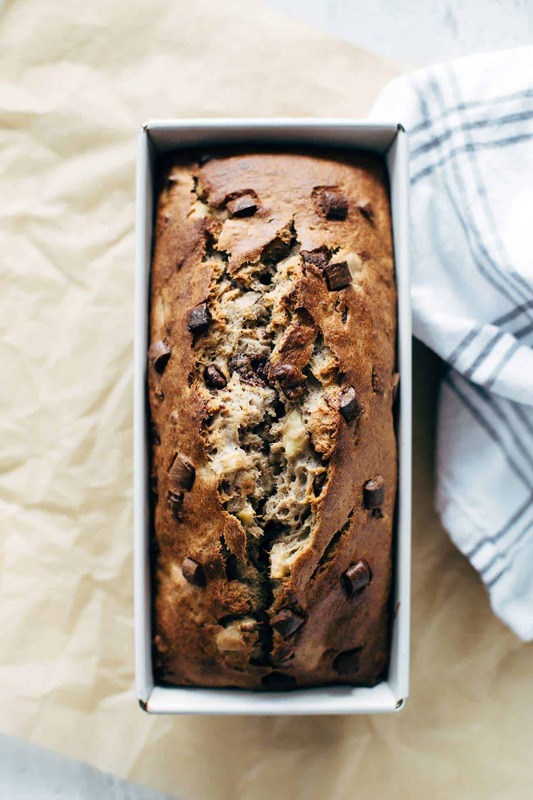 Super moist and soft Chocolate Banana Nut Bread. Just 10 ingredients & 10 minutes to prepare. Chocolate chips, banana chunks, and chopped pecans. Best banana bread ever! Friends, can you believe that we are in the middle of the last week of September? This month passed so quickly. Since I’m back from California, the time goes by like that. *snap* Yesterday 3 months ago I was on my way to San Francisco. I can’t believe it. What did you do 3 months ago? But enough from the past. Let’s talk about the present and your very near future. 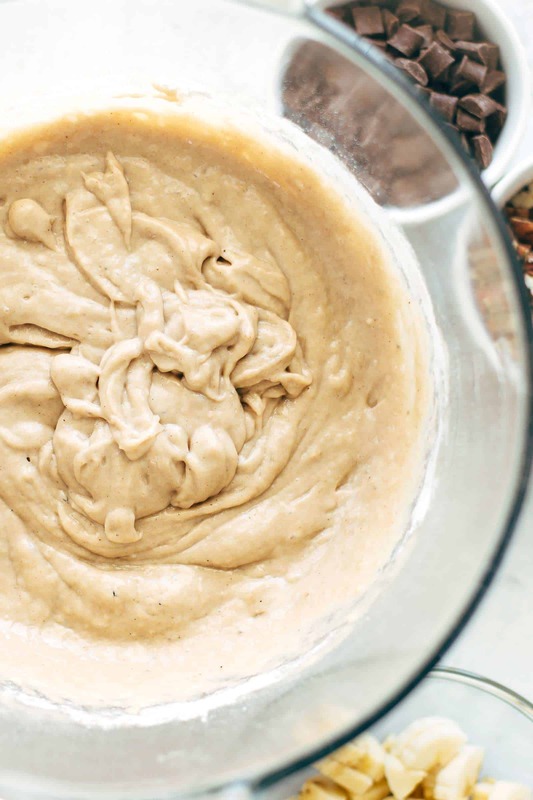 You are going to have the best Chocolate Banana Nut Bread ever. Seriously. 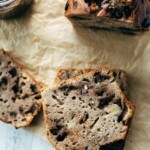 This soft and moist banana bread is divine. Full of flavor and the consistency is just perfect. I swear, it couldn’t be better. REALLY. Chocolate chips: chocolate is always a good combination to bananas. Everyone knows that. Everyone loves that. 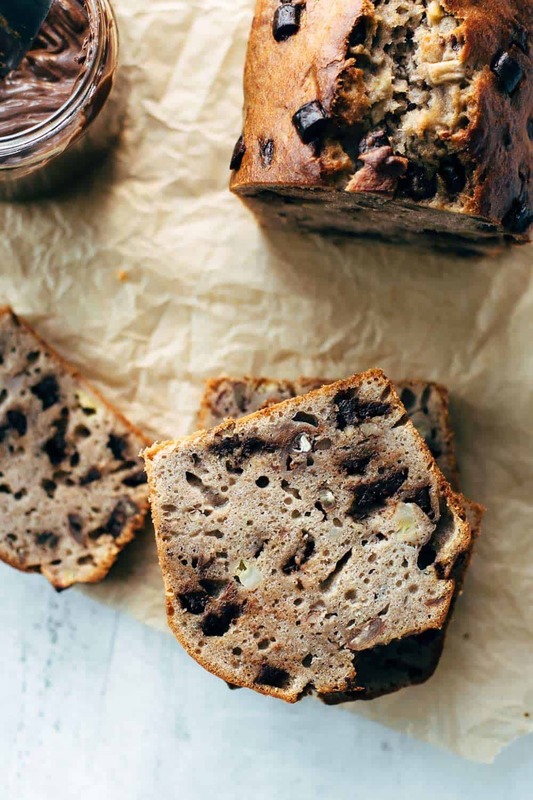 It doesn’t matter if you use semi-sweet chocolate, milk chocolate, or even white chocolate chips for this banana bread. Take the one you like the most. Banana chunks: hell yeah. There isn’t just banana in the bread batter itself, no no, there are also banana chunks in the bread. It’s hard to explain how wonderful it is when you bite into banana chunks in a banana bread. You taste fresh, soft, and sweet bananas in the bread. It’s just awesome. Chopped pecan nuts: in my personal opinion, pecan nuts are surely the best fit for this Chocolate Banana Nut Bread. But if you prefer other nuts instead of pecans, then go for it. There is no strict rule which nuts are allowed. Everything you love is allowed. Cashews? Peanuts? Sure! Whatever! This Chocolate Banana Nut Bread is super easy to make. Mash the bananas and stir together with sugar, oil, egg, and vanilla to combine. There is just 1/2 cup of brown sugar in the recipe. Just wanted to say. The brown sugar has a great taste and keeps the bread moist. The oil makes the bread super soft. Then add flour, baking powder, and salt and mix to combine. Fold in chocolate, banana chunks, and the chopped banana. Spread into a loaf pan and you are done with your work. The rest of the work does the oven. When it comes to sweet bread there is always the question: breakfast or dessert? What do you prefer? I can’t say it for sure because when I have banana bread at home, I generally start eating it in the morning and finish it at night. For breakfast, I love to smear peanut butter and Nutella on it. Or butter with honey or maple syrup. As a dessert, I eat it without anything. I can’t make a recommendation what is better. You have to find it out on your own. loaded with fresh banana chunks. packed with crunchy pecan nuts. the best banana bread ever. Enjoy your breakfast, uh or your dessert! However! If you make this Chocolate Banana Nut Bread recipe leave a comment, rate it and tag a photo #alsothecrumbsplease on Instagram! Would love to see your snap! You may also like Banana Bundt Cake with Chocolate Chips, Banana Cream Pie, Banana Chocolate Chip Pancakes, Super Moist Banana Bread, or click here to see all recipes. Mix mashed bananas and sugar with a handheld or stand mixer fitted with a paddle attachment just until combined for about 1 minute. Slowly mix in oil on lowest speed just until combined. Then add eggs and vanilla* and stir just until combined for about 1 minute. Don't overmix at any step. Add dry ingredients and stir to combine. 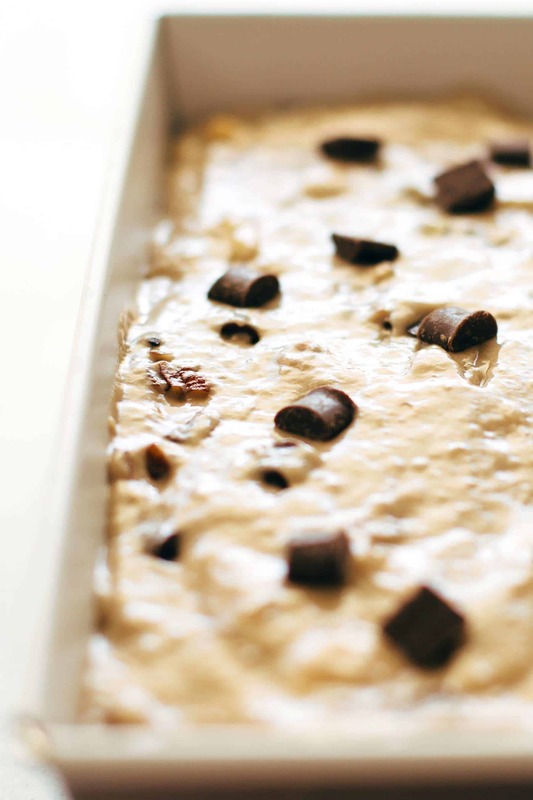 With a wooden spoon stir in pecan nuts, chocolate chips, and banana chunks just until combined. Transfer batter into a 9x5 inch loaf pan and bake for about 55-60 minutes or until a toothpick in the center comes out clean. Let cool completely before removing from pan. Store in an airtight container at room temperature for up to 3 days. Oh em gee. Stop it with those gorgeous pictures! 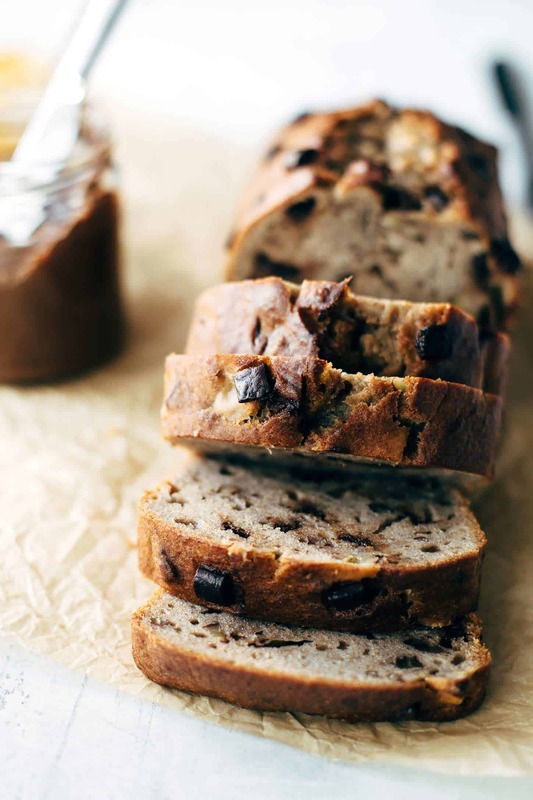 Banana bread is always one of my favorite things and I’m thinking I need to try yours ASAP! Would love to hear your thoughts on this after trying, Kelsie! Thank you so much.